ATG’s selection of hammer highlights over the past week include a George I walnut chest with some appealing decoration and a bronze sculpture of a golden eagle by Dame Elisabeth Frink. 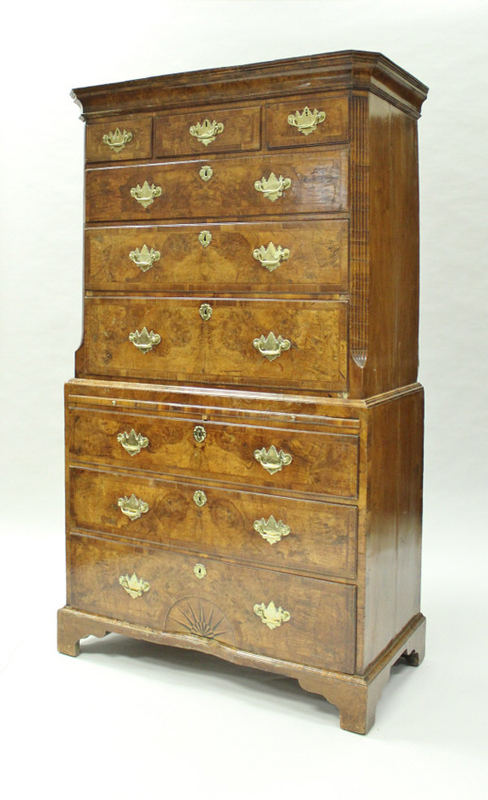 George I walnut chest on chest – £7000 at Moore Allen & Innocent. 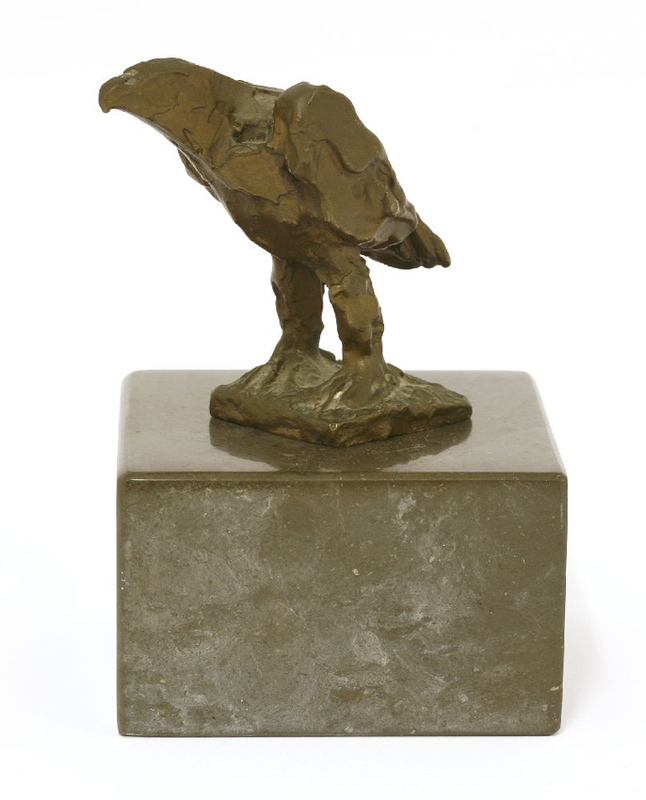 A bronze sculpture of a golden eagle by Dame Elisabeth Frink – £14,500 at Sworders. This small bronze of a golden eagle by Dame Elisabeth Frink RA (1930-93) – number 1 of an edition of nine – formed part of a significant group of works from the Modern British canon, offered at Sworders in Stansted Mountfitchet on January 16. The collection had been formed since the 1960s by the late Barbara Holliday, a farmer’s wife from north Cumbria. In addition to regular trips to auctions in the provinces and London – where the family owned a pied-à-terre overlooking the Chelsea Arts Club – she immersed herself into the British art scene, befriending and corresponding with a group of noted painters and sculptors. Many lots improved upon what were largely conservative estimates. The 4in (10cm) high bronze was one of a number of lots sold via thesaleroom.com, doubling hopes at £14,500 when it went to a London private buyer. Proof there is still life in the antique furniture market, this George I walnut chest on chest sold to a buyer via thesaleroom.com for £7000 at Moore Allen & Innocent of Cirencester. While the form is typical, it includes some appealing flourishes including a parquetry inlaid starburst, fluted canted corners and a brushing slide alongside the nine drawers. Save the later handles, the auctioneers deemed it a largely original piece. It was estimated at £1000-1500 at the auction on January 11. A silver tetradrachm or sela struck in the year 134/135AD during the Bar Kokhba or the Third Jewish Revolt – $17,500 (£13,745) at Goldberg. A silver tetradrachm or sela struck in the year 134/135AD during the tumultuous event known as the Bar Kokhba or the Third Jewish Revolt sold for $17,500 (£13,745) at Los Angeles numismatists Goldberg. Estimated at $5000, it was knocked down at the auction on January 8 to a bidder using thesaleroom.com. The coin depicts Simon bar Kokhba, the commander of the revolt, who was regarded by many Jews in the Roman province of Judea as the Messiah who would restore their national independence. To the verso is the façade of the Temple of Jerusalem and what may be a depiction of the Ark of the Covenant. The inscription can be translated as For The Freedom of Jerusalem. Ultimately facing a backlash from six full legions, the Jewish communities of Judea were devastated. According to the Roman historian Cassius Dio, 580,000 Jews perished in the war and many more died of hunger and disease or were sold into slavery. A photograph depicting engineer Captain H Adcock in Ghana that was part of three albums that sold for £2400 at Cheffins. 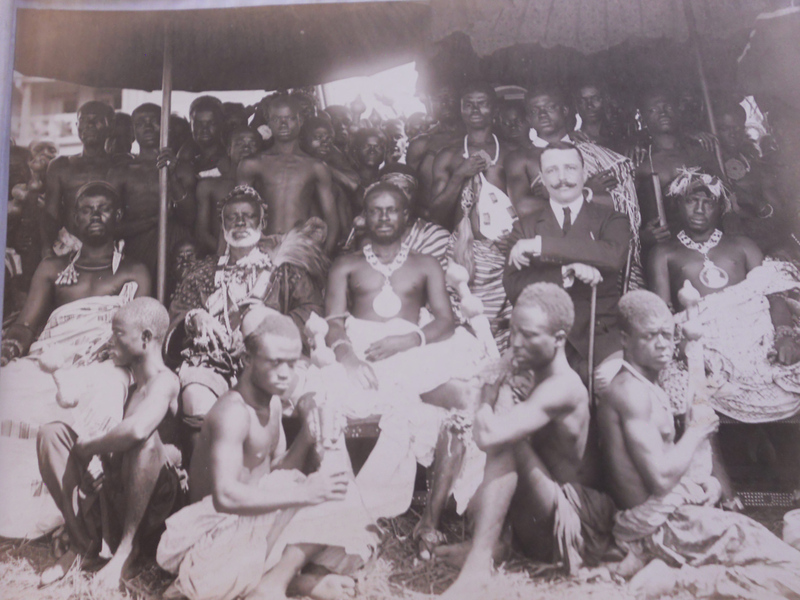 This evocative photograph depicts Captain H Adcock, a 19th century colonial engineer, together with the King of Akropong and his family and entourage. It was one of approximately 200 annotated platinum, gelatin silver and albumen photographs depicting scenes relating to the construction of the Gold Coast Government Railway in Ghana. The project, with the purpose of transporting gold from the newly-discovered Ashanti goldfields to Sekondi docks, began in 1898. The first section from Sekondi to Tarkwa was completed in 1901 when Adcock returned home to Norfolk. The photograph was one of three albums of varying size sold as a single lot for £2400 at Cambridge auctioneer Cheffins on January 10. Estimated at £120-180, it was bought by a bidder on thesaleroom.com. The following lot was another leather bound album with 43 photographs relating to Adcock that fetched £13,000 against a £80-120 estimate. 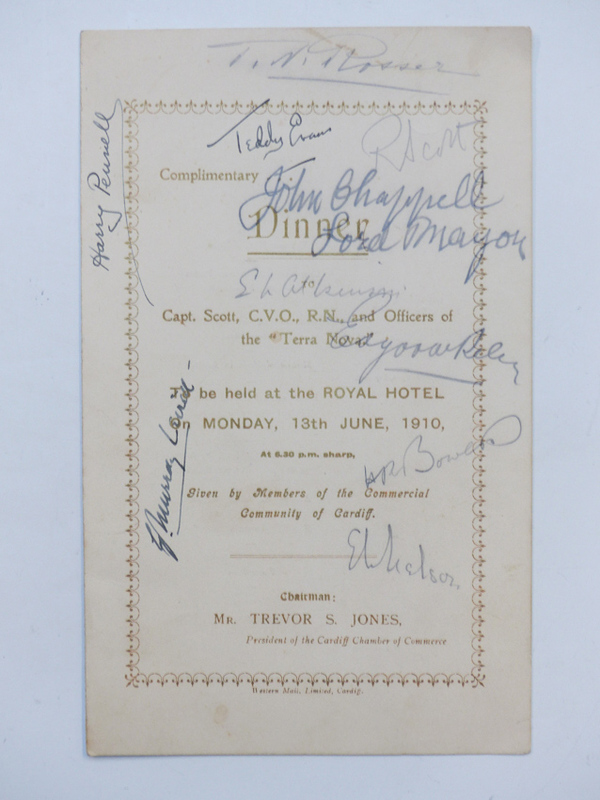 A signed menu from a dinner hosted by Captain Thomas Newland Rosser for the officers of Captain Scott’s Terra Nova ship – £5100 at Stroud Auctions. Ephemera relating to Captain Robert Falcon Scott’s doomed British Antarctic Expedition appeared for sale at Stroud Auctions on January 8-9. The items were consigned for sale by direct descendants of Captain Thomas Newland Rosser (1857-1935), dockmaster at Bute Docks, Cardiff where the Terra Nova ship set sail in June 1910. Rosser met Scott on several occasions prior to the expedition’s departure. Among the lots from the sale sold via thesaleroom.com were a signed menu from a dinner Rosser hosted for the officers of the ship at the Royal Hotel, Cardiff, on June 13, 1910 (two days before sailing) and a receipt for £2 2s 0d in a British Antarctic Expedition envelope that Scott had signed with a handwritten note "very many thanks for this and all the facilities it gave us". Although estimated to bring around £200 each, they took £5100 and £3500 respectively.